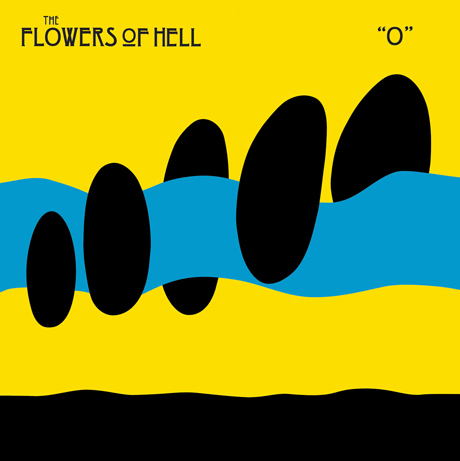 If you've been itching to check out Flowers of Hell's O, the Canada/UK outfit's sprawling new album made up of a single 45-minute track, now is your chance. We now have the entire record streaming here in Click Hear. The album was recorded in Toronto with engineer Jon Drew (Fucked Up, Tokyo Police Club) and mixed in Manchester, UK by Flowers of Hell leader Greg Jarvis and Tom Knott of the Earlies. Both Jarvis and Knott have synaesthesia, a neurological condition that causes the senses to intermingle, leading the band to dub O "a vibrant 3D world of synaesthetic sights." According to Jarvis, "While I was working on building a virtual world of shimmering, pulsating shapes all around us, he [Knott] was swathing us in vibrant colours, casting them about the room,"
O, as well as the accompanying DVD Live at the Music Gallery, will come out through Optical Sounds/Outside Music on November 16. Also, the band will be playing the entire album on Saturday (November 13) at St. Stephen in the Field (103 Bellevue Ave.) in Toronto. You can stream the entire album below.